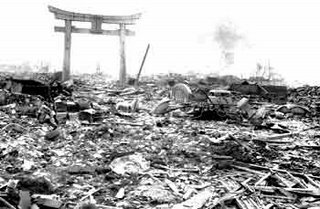 On this Hiroshima Day, I had no pictures of the aftermath of Hiroshima. This is Nagasaki, Japan 1945. (Courtesy of angevoix who runs the blog, Inexpugnable, at http://inexpugnable.blogspot.com/ ) As I mentioned yesterday, Nagasaki was the center of Christianity in Japan. Ground Zero was the St. Mary’s Cathedral of the Catholic community and both pilot and bombadeer were practicing Catholics–National loyalties trumping the supposedly greater ties of sisters and brothers in Christ. Tonight, I will attend in Louisville a candle/paper lantern lighting ceremony, a traditional Japanese prayer for peace. 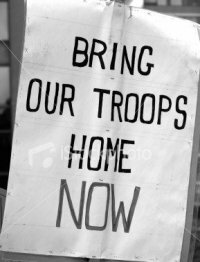 The point is not who was right or wrong in that terrible war or any war. The point is to mourn the dead and work to make certain such evil never happens again. O God Whom we crucified anew in the fires of Hiroshima and Nagasaki, and Whose Image and Likeness in humans is even now being repeatedly destroyed in Iraq, Israel, the Gaza Strip, and Lebanon, give us wisdom and courage to find a better Way, a Way to stop the bloodshed and make peace. Amen.